I’m a soup-making fiend right now. Perhaps it’s because at the start of January I was smart, took those few quiet days at the beginning of the year to stock my pantry with lots and lots of beans. While most dried bean-preparation requires forethought (like soaking them the night before), lentils do not. Having these beautiful red lentils in my cabinet have yielded delicious soup after delicious soup. All are able to be whipped up at a moment’s notice. First there was a recipe with mushrooms, lentils and lots of ras al hanout, which I ate with crusty bread. Then there was a curried version studded with beautiful golden raisins and served with warm naan bread. This iteration was created by my craving of a good chicken tortilla soup. 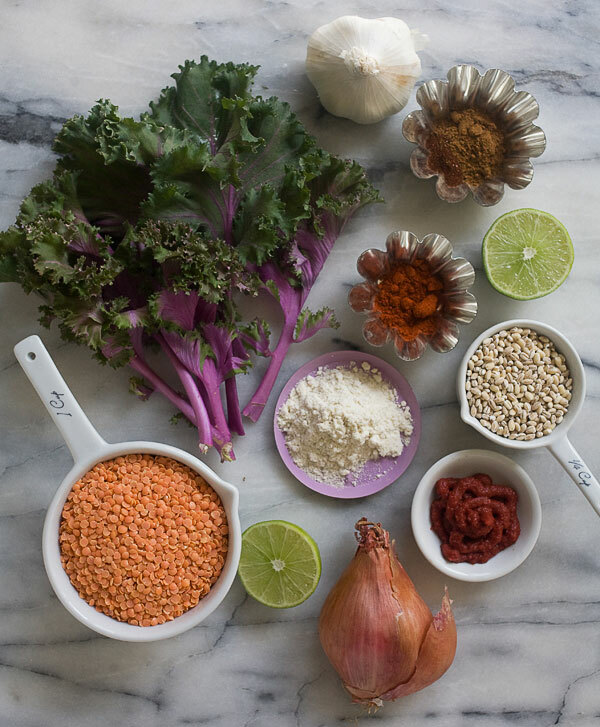 The night I made this lentil soup recipe, there wasn’t any chicken in my fridge – just kale, mushrooms and tortillas. I added barley because that, too, lived in my pantry. 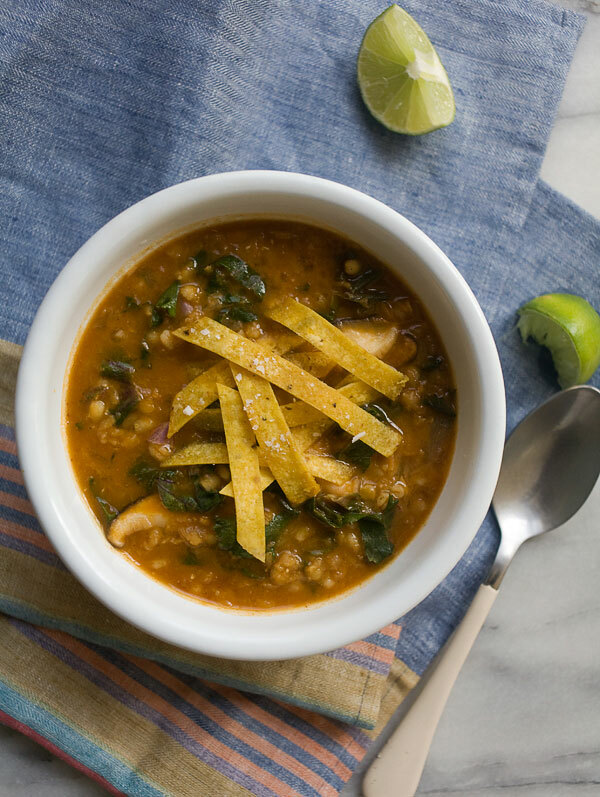 While it’s nothing like chicken tortilla soup, really, the broth is similar. It’s a tomato-y broth and spiced with ancho chile powder, paprika and cumin. I love the addition of masa (a trick I learned from Ree Drummond’s chili), which adds a lovely corn flavor and thickens the broth up nicely. If you don’t have it, don’t worry, skip it! It’ll be delicious with or without it. This is the soup I want to eat on a cold day or a warm day, even. It achieves being light and filling all at the same time, which is no easy feat. 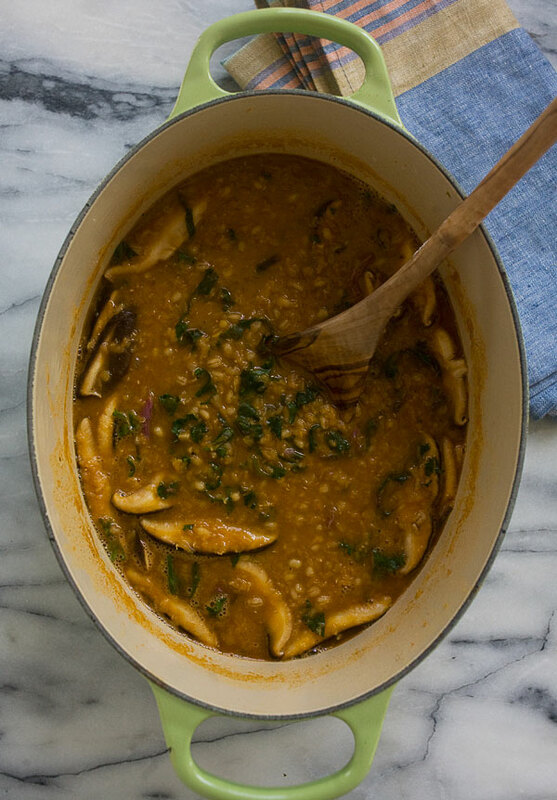 This lentil soup is light and filling all at the same time with little preparation. Food blogger Adrianna Adarme of the Fresh Tastes blog adds masa to thicken the broth. To a medium pot, heat the olive oil over medium heat. When the oil is warm, add the shallot; cook until the shallot becomes translucent, about 3-5 minutes. Mix in the minced garlic cloves, pearl barley, tomato paste, cumin, ancho chile powder and smoked paprika. Cook for about a minute, just enough time for the barley to lightly toast. Pour in the chicken (or veggie broth, if using) and bring the soup to a slight simmer. Place a lid on the pot and cook the soup on low heat for 15 minutes, until the barley is barely tender. Pour in the lentils, mushrooms and masa. Cook for an additional 10 to 15 minutes, until the lentils and mushrooms are cooked. Fold in the kale and cook for an additional minute, just until it's wilted. Salt to taste. Meanwhile, to make the fried tortillas strips, add a few tablespoons of olive oil to a skillet and place over high heat. When the oil is hot, add the tortilla strips and cook until crispy, about 1 minute. Remove with a fork and allow to drain on a paper towel. Immediately season with a few pinches of salt. Divide the soup between bowls. 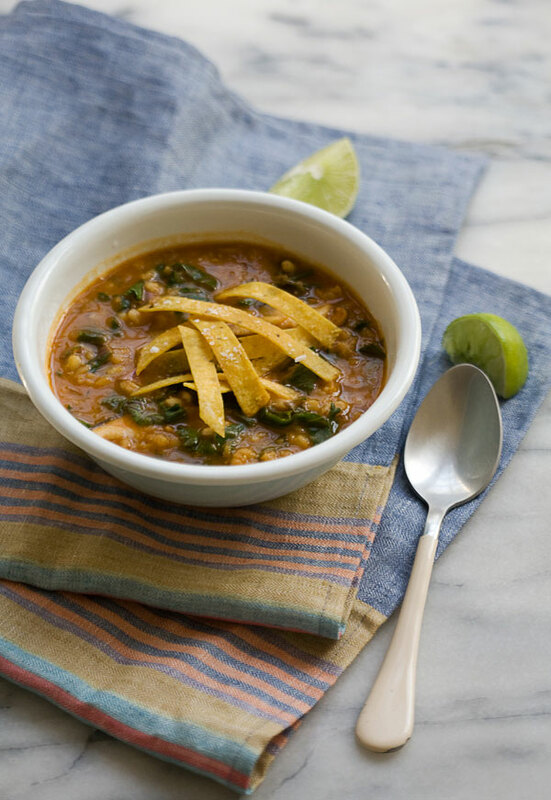 Garnish each soup with a squeeze of lime and a few tortilla strips. 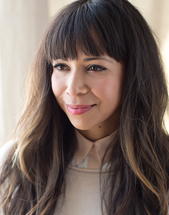 Adrianna Adarme is a food blogger and author living in Los Angeles, California. She writes the blog A Cozy Kitchen, where she shares comforting, everyday recipes from her kitchen. She recently authored her first cookbook, PANCAKES: 72 Sweet and Savory Recipes for the Perfect Stack. She’s a lover of breakfast, pie (and sometimes even pie for breakfast), corgis and cute things. You can find her on Twitter, Instagram, or Facebook.